Well, for starters, there’s larger class sizes. Northside’s predicament mirrors that of several other local districts with expanding enrollments. It’s part of the argument hundreds of Texas districts are making in an ongoing school finance lawsuit against the state, blaming lawmakers for a funding scheme that doesn’t keep up with growth. 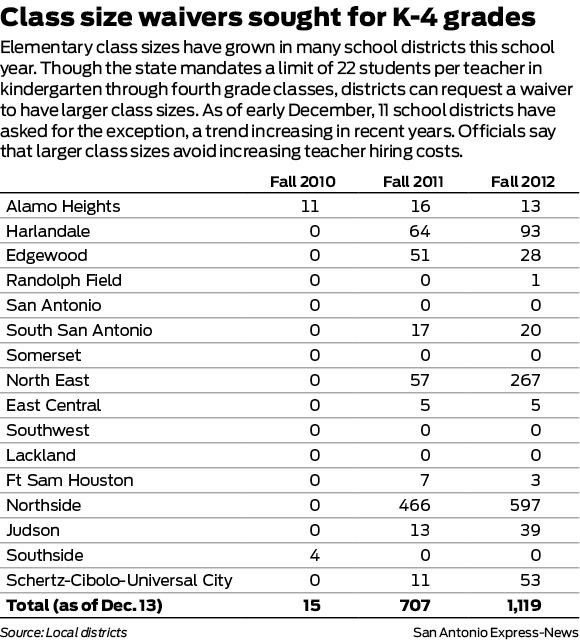 Administrators say larger classes are cheaper than hiring more teachers. There’s no state limit on class size for grades 5-12. In kindergarten through fourth grade, school districts must seek permission to go above 22 students per teacher — and the number of requests for such waivers from several local districts has skyrocketed in the past two years. School boards, lawmakers and even presidential candidates this year debated whether larger classes hurt education. Southwest ISD has found a way around the waiver requirement by using a “multi-grade” setup, placing some students overflowing from a lower grade into a higher grade classroom and having the teacher instruct the appropriate curriculum. Verstuyft said the district might need to end that experiment and opt for waivers — enrollment is swelling with population attracted by nearby manufacturing plants and the Eagle Ford Shale energy drilling boom. Now at 13,024 students, Southwest added about 600 in each of the past two years since the Legislature cut its funding by almost $12 million. FYI, Southwest ISD’s revenue for 2011-12 was $105 million, so they experienced a ten percent growth in enrollment over the past two years while dealing with a ten percent cut in funding. Doesn’t sound like a recipe for continued success to me. But surely with all that extra revenue coming into the state things will be better in the next biennium, right? Republican leaders heading into the new legislative session say they are in no hurry to undo billions of dollars in cuts to public schools made two years ago. So there you have it. Frankly, I wouldn’t hold my breath waiting on them to add funding to cover enrollment growth. It’s not a priority for them. I’ll say it again, nothing will change until the government changes. It’s as simple as that. EoW has more.